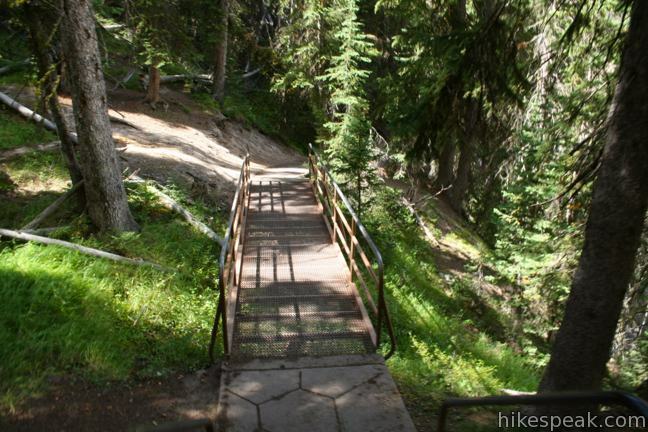 If Uncle Tom’s Trail can be called a trail, then you can just as easily say you are going for a hike any time you take the stairs instead of the elevator. 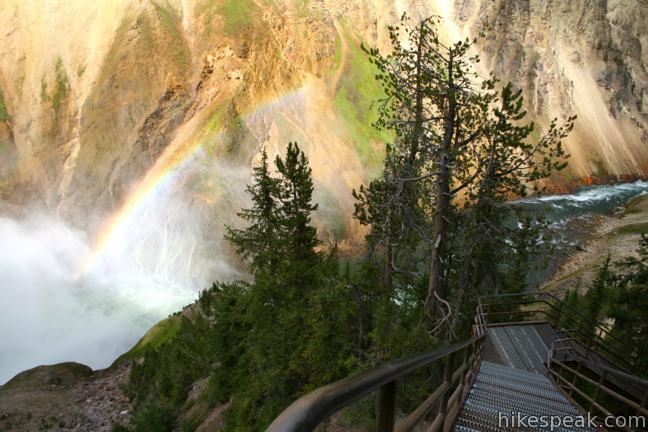 This Yellowstone National Park trail consists of over 300 steel steps built down the south wall of the Grand Canyon of the Yellowstone River next to the park’s most impressive waterfall. 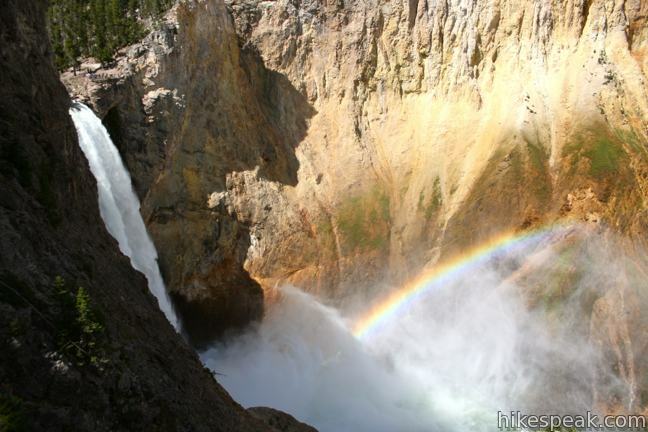 The up-close views of Lower Falls are electrifying and this 0.7-mile round trip hike (with 500 feet of elevation loss) is as unique as they come. 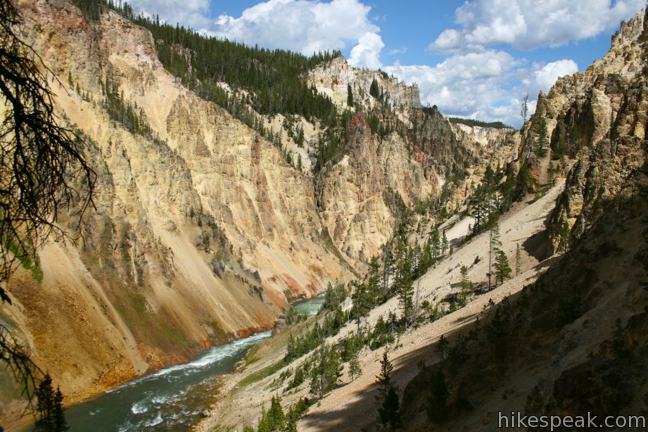 Shortly after 1900, “Uncle” Tom Richardson took visitors down into the Canyon along this trail. 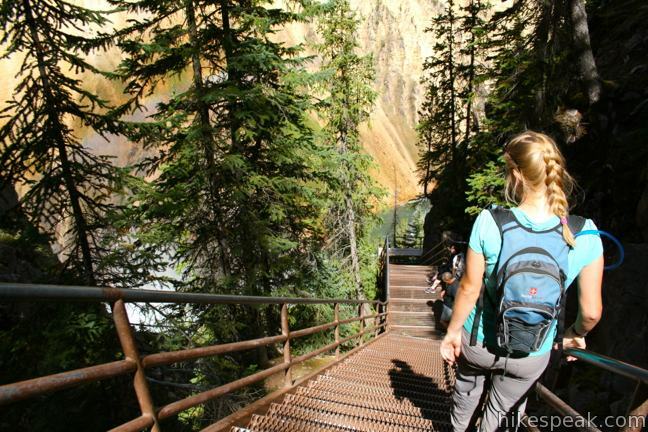 Originally with 528 steps and rope ladders, it now descends 328 steps or about 3/4 of the way down in to the Canyon for an excellent view of the Lower Falls. 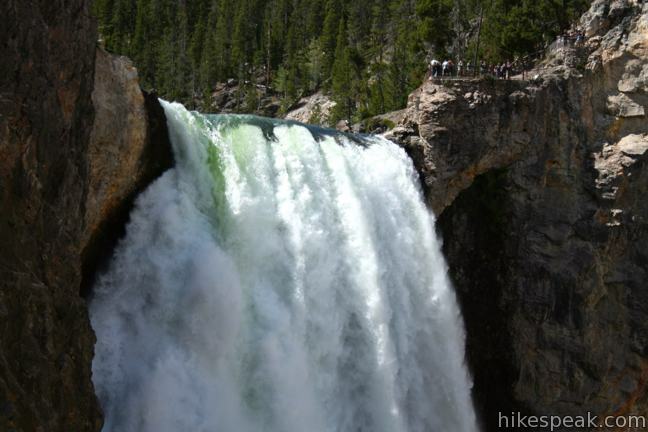 Richardson ferried guests across the Yellowstone River to a safe landing above the Grand Canyon where they would hike along the canyon rim to a place where Richardson had constructed an innovative series of ropes and steps to convey adventurous tourists to the base of Lower Falls. Tom Richardson’s route has been improved over the last century and a more significant (and rope free) staircase now clinging to the canyon wall, leading to a viewing platform just down the river from the massive 308-foot drop of Lower Falls. 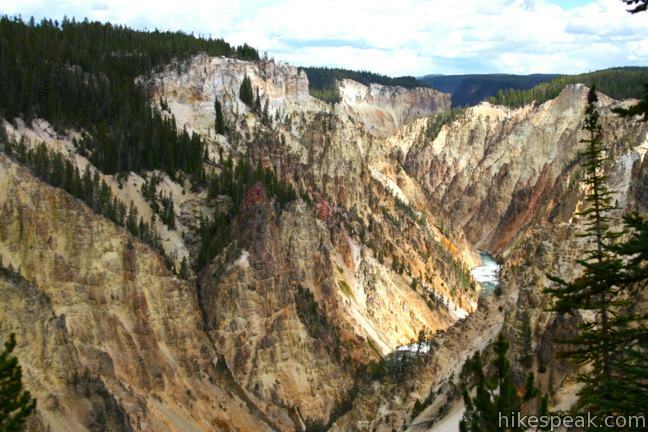 Today’s visitors don’t need to cross the Yellowstone River in a rowboat and can drive right up to a large parking area for Uncle Tom’s Trail along South Rim Drive. You will begin with some stair-free hiking toward the canyon’s edge, reaching South Rim Trail a tenth of a mile from the parking lot. 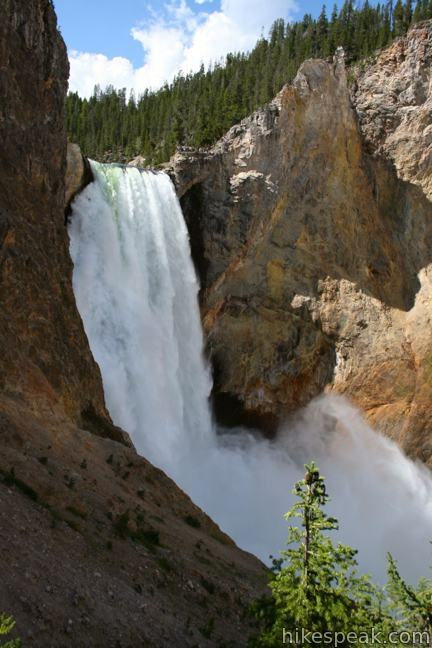 For additional hiking, follow this trail west for more views of the upper and lower tiers of Yellowstone Falls, or venture east toward Artist Point and the trail to Point Sublime. Turn right, following the sign for Uncle Tom’s Trail toward another junction fifty yards ahead. Turn left and begin down Uncle Tom’s Trail. After another fifty yards, you’ll reach a third junction with a spur trail breaking off to the left toward an overlook. The viewpoint, another fifty yards up a level spur, offers a nice view down the canyon away from the waterfall. You may wish to save this view for the hike back up, when you will be looking for a good excuse to catch your breath after climbing those 328 steps. 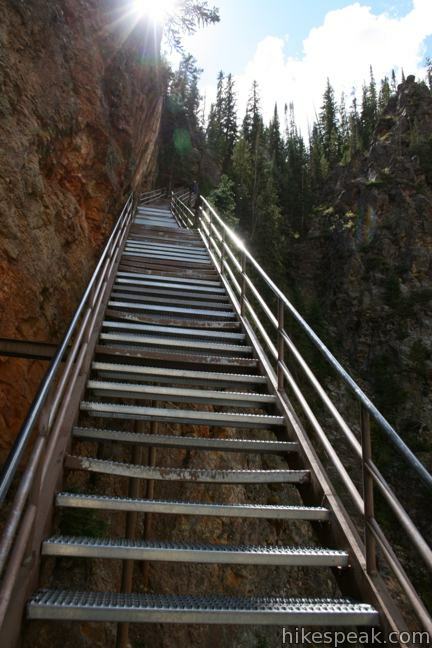 Below this last junction, Uncle Tom’s Trail stops being a walking trail and becomes a series of steep steps made of perforated steel (that way you can look straight through the stairs for an extra dose of vertigo). There is a railing to grab hold of on the riveting descent into the canyon. 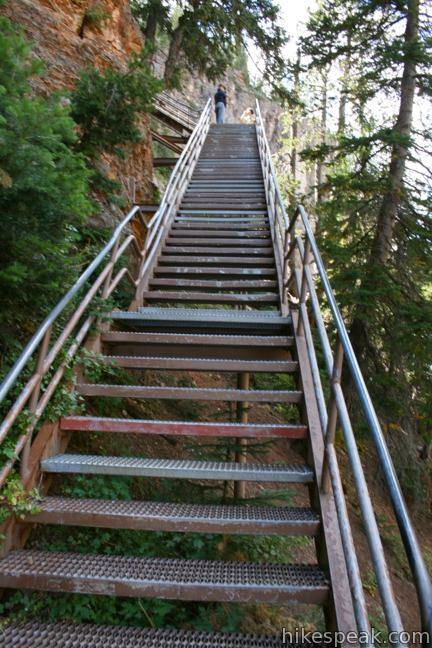 It is possible to get down the trail in just a few minutes, but remember that it will be a lot harder to hike back up the stairs, especially if you are not in great shape. The daunting staircase wraps down the rocky canyon wall, reaching a viewing platform in a cluster of pines just below the powerful 308-foot waterfall framed by jagged orange rock walls. 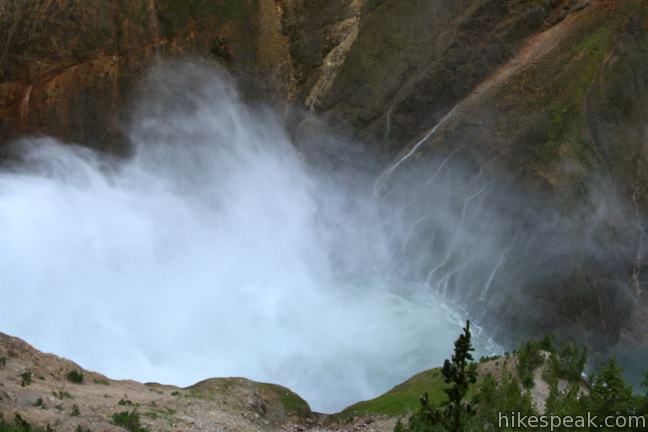 It is estimated that a minimum of 5,000 gallons of water flow over the waterfall each second during the dry fall season, and over 60,000 gallons per second fly over the Lower Falls during peak spring runoff. 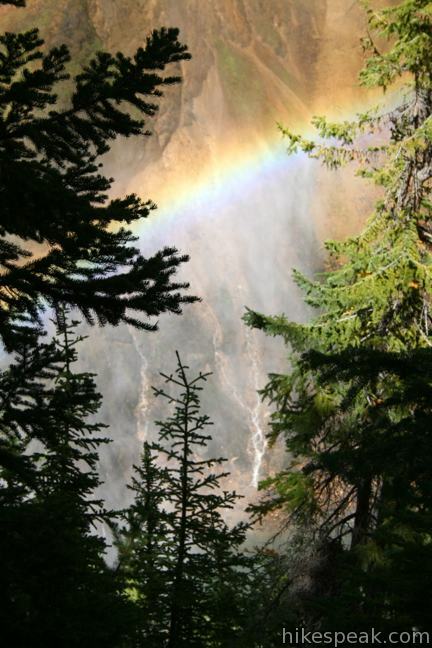 The waterfall creates a dense mist as it crashes to the bottom of the canyon. 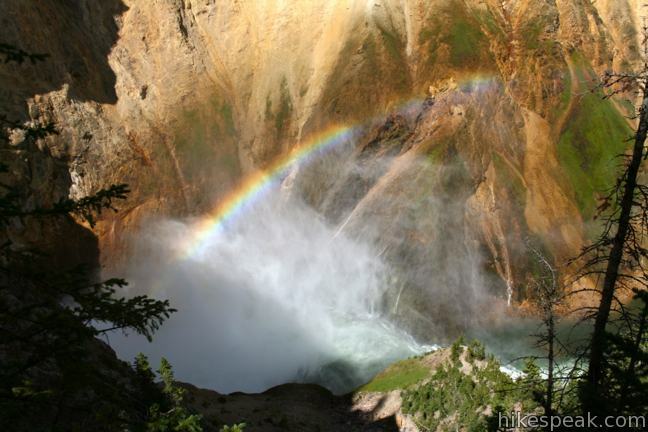 Water droplets collect on the sides of the canyon, creating streams that run back into the river. 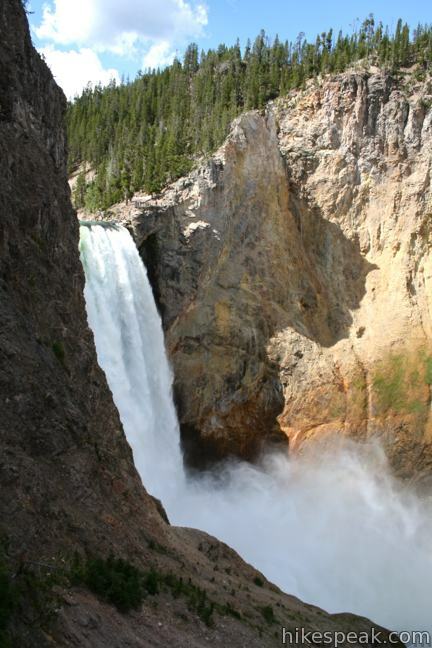 To get a sense of the waterfall’s magnitude, check out the miniature-looking humans standing on the viewing platform at the brink of the Lower Falls (which can be reached by hiking down from North Rim Trail). 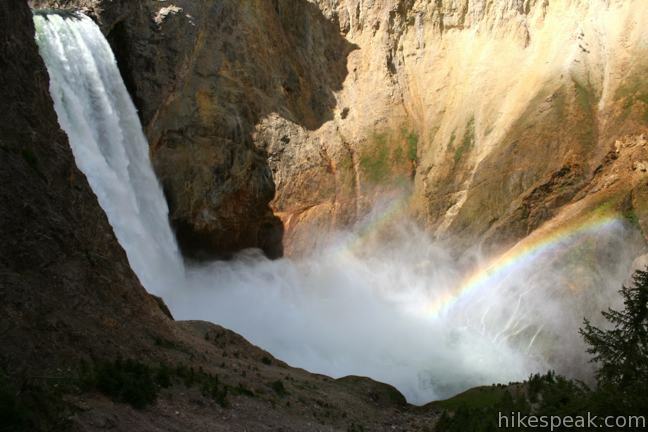 The bottom of Uncle Tom’s Trail delivers an intense view of Lower Falls, and you may even spot waterfalls forming in the mist. 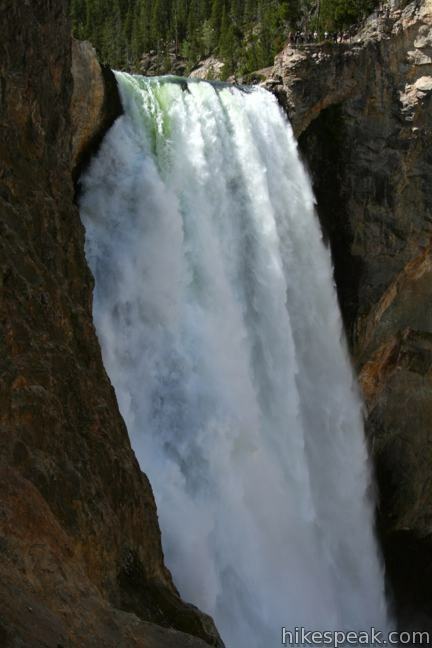 Seeing a large and powerful waterfall this close up is sure to create a lasting impression. 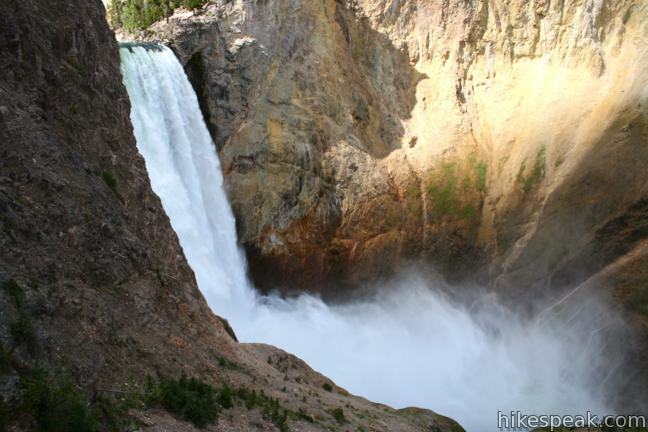 If you get winded hiking back up the stairs, simply spin around and take another picture of Lower Falls. Each steps delivers a slightly different perspective of the beautiful waterfall. 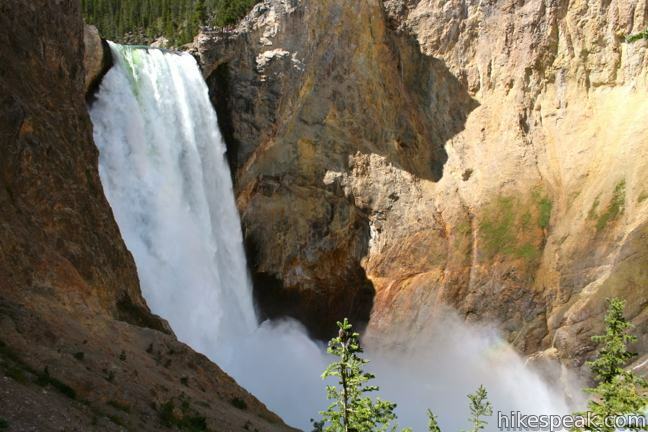 Yellowstone National Park has an entrance fee, but no permit is required to hike Uncle Tom’s Trail, so get out and enjoy! To get to the trailhead: From Canyon Junction, where Norris Canyon Road and Grand Loop Road meet, drive 2.2 miles south and turn left onto South Rim Drive. 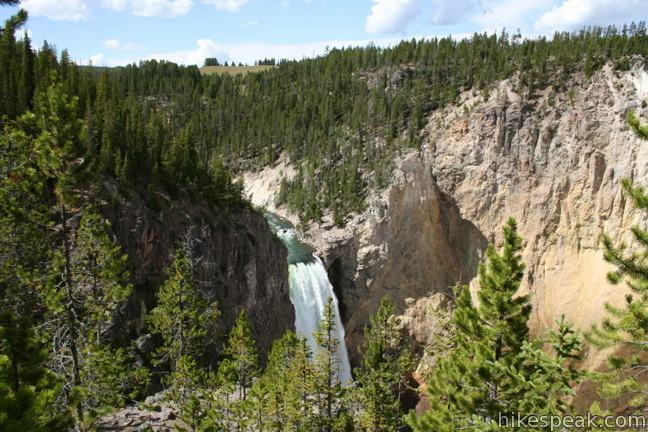 Cross the Yellowstone River and drive another half mile, making the first left into a large parking area for Uncle Tom’s Trail and South Rim Trail. 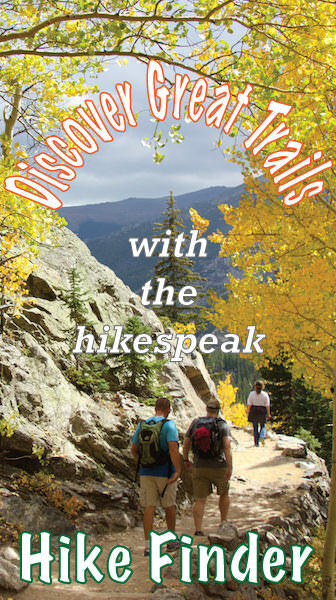 Uncle Tom's Trail by hikespeak.com. Are there any safety overhead shields above the steps to protect the people from falling rock? 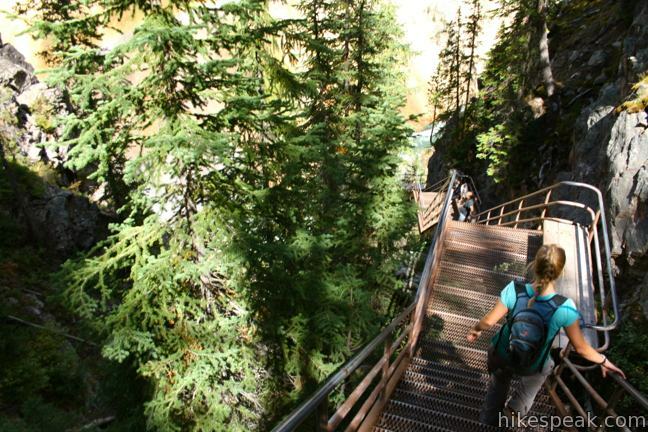 Hi, There is no awning over the stairs, but this is a safe & popular trail. 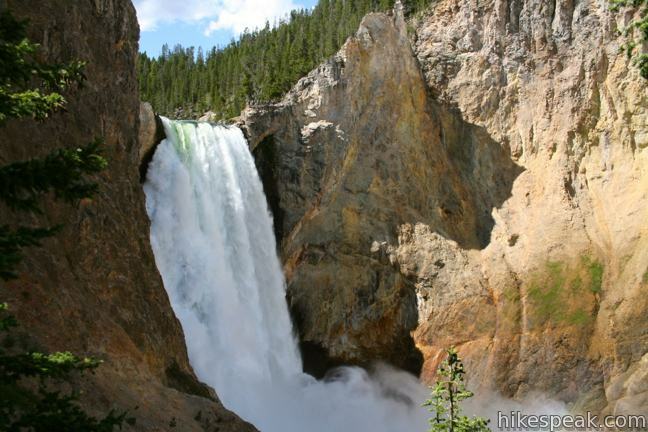 We were stunned by the intensity of the experience of seeing the Lower Falls from the platform on Uncle Tom’s Trail. It was a never-to-forget experience. My wife and I are in our fifties and the hike down and up got us a little winded, but we took our time enjoying the entire experience. 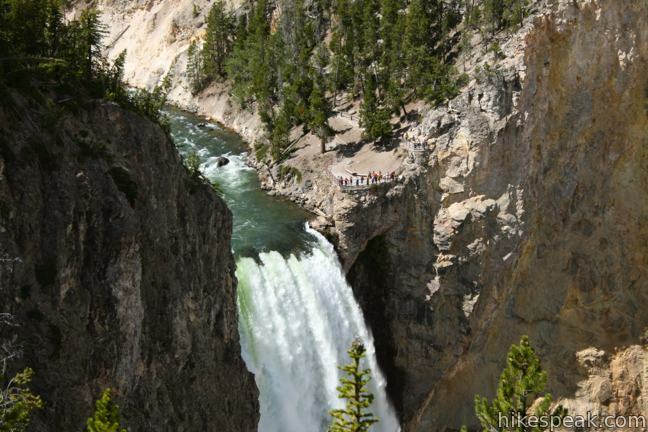 Next time we are there, we will hike to the edge of the falls and stand there with the people we saw from the platform. They look like ants from that distance. Unbelievable!!! I have the same question about the tower falls trail. Does anyone had the answer? Thanks! Greetings from the Netherlands. Early in the day will be best, but any time of day should be great for photos! This trail has been under construction for the last year and is still under construction. You won’t be doing this trail until 2019!